Louis Philippe Joseph d'Orléans, Prince o the French bluid ryal (13 Apryle 1747 – 6 November 1793) commonly kent as Philippe d'Orléans, wis a member o the Hoose o Orléans. He actively supported the French Revolution and adoptit the name Philippe Égalité, but wis still guillotined during the Reign o Terror in the French Revolution. His son Louis Philippe I became Keeng o the French efter the July Revolution o 1830. He held the rank o prince o the bluid. He haed a short affair wi Madame de Genlis, a lady-in-waiting o his wife. Born ootside Paris at the Château de Saint Cloud, he wis gien the title o Duke o Montpensier at birth. He haed the rank o a Prince du sang (prince o the blood) at the French royal court which allowed the uise o Serene Highness in documents. Eventually he wis engaged tae a distant cousin Louise Marie Adélaïde de Bourbon, Mademoiselle de Penthièvre, then the greatest heiress in Fraunce an the twa war mairit in the Royal Chapel o Versailles on 5 Aprile 1769. Louis Philippe d'Orléans, Keeng o the French (6 October 1773 – 26 August 1850) mairit Maria Amalia o Naples and Sicily. 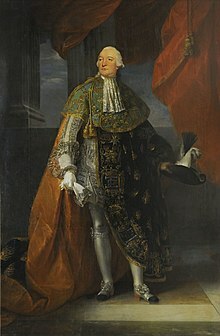 Antoine Philippe, Duke o Montpensier (3 July 1775 – 18 Mey 1807) died unmarried. Adélaïde d'Orléans, later made a "'Princess o Orléans'" (23 August 1777 – 31 December 1847) died unmarried. Louis Charles d'Orléans, Coont o Beaujolais (17 October 1779 – 30 Mey 1808) died unmarried. This page wis last eeditit on 3 Mairch 2019, at 12:43.